The Homecare service you receive from us is fully regulated, inspected and rated by the Care Quality Commission (CQC) for England. We welcome and comply with the registration and inspection and auditing process that regulation brings. The CQC is the independent regulator of Health and Adult Social Care in England. It makes sure Health and Social Care services provide people with safe, effective, compassionate, high-quality care and it encourages care services to improve. • monitor, inspect and rate services. • take action to protect people who use services. • Protects the rights of vulnerable people, including those restricted under the Mental Health Act. • Listen to and act on your experiences. • Work with other organisations and public groups. Click to read more about the CQC. 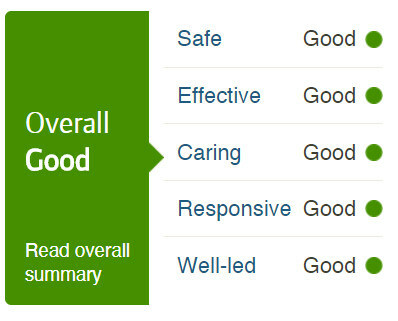 Our Homecare service was inspected in October 2016 by the CQC and was rated and approved as Good, which is the 2nd highest rating CQC can award. Click to read our report. Care Quality Commission carried out this inspection under section 80 of the Health and Social Care Act 2008 as part of its regulatory functions.